PEmicro Microcomputer's new DEV5213CF is an ideal evaluation kit for getting started on ColdFire MCF5213 projects. The evaluation board contains an embedded PEmicro USB to BDM interface which provides for easy debug and flash programming of the resident ColdFire MCF5213 processor. The MCF5213 device is a 32-bit ColdFire processor which incorporates 256KB of Flash, 32KBytes of RAM, Digital I/O, ADC, QSPI, PWMs, timers, a PLL, I2C and more. The processor runs at a system clock speed of up to 80MHZ which gives 76MIPS of performance. Included is the 64K Starter Edition of PEmicro's PKGCFZPRO software development package which provides the capability to compile, debug, and flash program up to 64KB of user C code. This software suite includes the PEmicro In Circuit Debugger, Flash Programmer, and WinIDE integrated environment with built in GCC Compiler. A Quick start Manual and sample template project will give you a jump start on an interrupt driven firmware design. Built in circuitry to provide a clock to the target from an 8Mhz crystal or a user provided oscillator. LEDs connected to GPT0/1/2/3 port pins. These may be disabled via on-board jumpers. Ability to power the development board from the PC's USB bus or from a power regulator provided by the user. Headers providing access to all the processor's pins - individually labelled for easy access. SOIC, TSSOP and DIP through-hole development areas. Schematics of the DEV5213 development board (without USB-to-BDM circuitry) designed to allow the user to easily transition to their own hardware design. An unlimited amount of user code may be compiled, debugged, and flash programmed into the target processor (versus 64KBytes loaded code, 5000 source lines, 2500 symbols). The starter kit WinIDE limits source to 5000 lines, symbols to 2500, the load size (64K) into the debugger, the programming size (64K) in the flash programmer, and the code size (64K) of the output file generated by the compiler. No limitation is made to the GCC compiler included in the starter kit which can be run without limitation from outside of the development environment. The full edition comes with PEmicro's assembler and assembly templates. While the starter kit includes templates to demonstrate functionality of different ColdFire evaluation boards, the full version adds many other templates supporting a wide range of hardware and memory configurations. 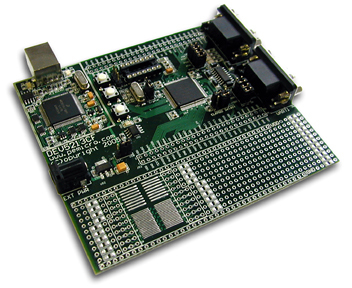 The development board includes a USB interface so no separate BDM interface is provided. The starter kit includes the interactive flash programmer in which the user directly controls the flash programming process (included in the full edition). The full edition also comes with an automated version of the flash programmer which allows programming according to a script file for production programming. The WinIDE Integrated Development Environment supports the ColdFire architecture. This is the primary editing environment for the software kit. It is also the launch pad for other PEmicro applications such as the in-circuit debugger, in-circuit flash programmer, and GCC C-compiler. Many of the settings for these applications, especially the GCC compiler, are controlled from within the WinIDE environment. This is a version of the GNU/GCC ColdFire compiler toolset compiled by PEmicro to operate directly under the Windows environment without requiring the installation of a Unix shell. The compiler is integrated into WinIDE and allows for one-touch compilation of a C-level project. The package supports the following family members: 5206, 5208, 5211, 5213, 523x, 5249, 5271, 5272, 5275, 5280, 5282 and includes startup code, linker scripts and Quick start manuals for popular development boards. This compiler produces both the Elf/Dwarf 2.0 and S19 output formats. The Elf/Dwarf format is loadable by PEmicro’s in-circuit debugger and the S19 is loadable by PEmicro’s in-circuit flash programmer. Take a look at one of our Quick Start Guides to see how easy it is to get a project underway! This PKGCFZ_PRO Quick Start Guide is a step-by-step guide for using the NXP/Freescale ColdFire M5272C3 development board with PKGCFZ_PRO_USB. (The M5272C3 board is not included with PKGCFZ_PRO_USB). PEmicro provides technical support for one year for the WinIDE environment, debugger, and flash programmer. PEmicro does not directly provide technical support for using the GNU compiler but has integrated the compiler very well into its tool chain. The WinIDE environment allows very good control of the input options and files to the GNU compiler. PEmicro's debugger and flash programmer support debug and flash programming of the code produced by the GNU compiler. In-circuit debugger for ColdFire devices. This Windows debugger supports reading/writing registers, memory and variables, loading code, and controlling processor execution with links to both assembly language and high-level languages (such as C). The debugger supports the ELF/DWARF(2.0) debug file object format, which is output by many compilers, including the GCC compiler supplied with this package. To see which Flash devices are supported follow this link .